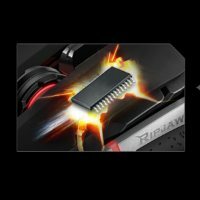 Today we get an opportunity to take a look at some new products from G.Skill. Surprise, surprise though, its not memory or an SSD, but something for the gaming crowd. 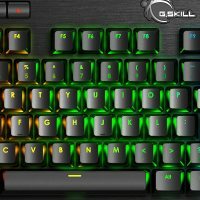 G.Skill has decided to take a jump into the market and expand its Ripjaws line with the new KM 780 mechanical keyboard, SR910 7.1 Surround heaphones, and MX780 laser gaming mouse (among other offerings). 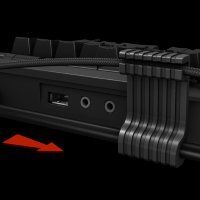 On the surface it looks like a lot of bells and whistles from the full individual LED keys on the keyboard, to the 10 discrete (5 for each ear) drivers in the cans, to the Avago gaming sensor used in the RGB mouse. This is probably going to be one of my favorite reviews as I get to test out these new products by gaming, and listening to music among other things. Let’s see how they worked out! 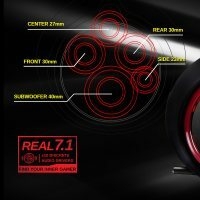 Below is a list of specifications and features for all three devices (images sourced from G.Skill website). 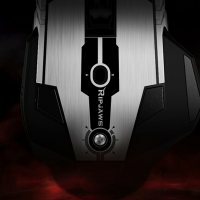 The MX780 Gaming mouse uses an Avago Laser Sensor with a DPI between 100-8200. The polling rate comes in 125 Hz, 250 Hz, 500 Hz, and 1000 Hz speeds. It has a four-zone full RGB back-lighting so you are able to independently control the color on each of those four zones. The micro switch used is made by Omron and is good to over 2 million clicks. The mouse has a total of eight programmable keys and the ability to store five profiles in its 512KB of on-board memory. Its smooth glide across the mouse pad is handled by PTFE glide pads. It weighs in between 111g and 120g depending on the use of the included 4.5g weights to help balance the device under your hand. Gaming Grade Avago Laser SensorEquipped with the latest gaming-grade Avago laser sensor, capable of up to 8,200dpi and 1,000Hz polling rate, dominate gaming sessions with swiftness and high precision control. 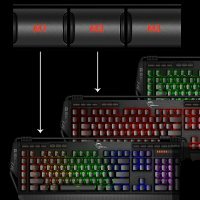 The KM780 is a mechanical keyboard with either Cherry MX RGB Brown or Red switches depending on the model you buy. Each key is fully backlit and programmable with Anti-Ghosting, and full N-Key Rollover. There are six programmable macro keys to simplify multiple keystrokes to one simple button press. With the software, you are able to control how the RGB keys light up and you can save that as one of three available on-board profiles. There is also a dedicated media panel that has 1/8″ inputs and USB pass through as well. The keyboard’s dimensions are around 20″ x 7″ x 2″ without the palm rest. 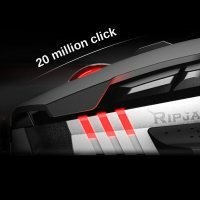 RIPJAWS KM780 RGB uses only genuine Cherry MX key switches with short 2mm actuation distance and durability of 50 million keystrokes for long lasting and quick gaming response. 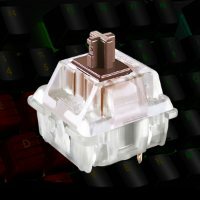 Cherry MX Brown key switches provide fast double tap response for intense play and light tactile feedback for easy daily typing. Each key is programmable with its own key function or macros, as well as independent per-key backlighting in full 16.8 million colors and lighting patterns options for the ultimate customization experience. The SR910 Gaming headset is a true 7.1 headset. It has a total of ten drivers (five on each side). They range in size from 23mm for the rear, 30mm for the front and center drivers, and 40mm for the subwoofer (all 32Ω @ 1KHz). The frequency response of the system is 20-20,000 Hz. The microphone is a typical unidirectional noise cancelling condenser type with sensitivity of 36±3 dB and a frequency response of 50-10,000 Hz. The headset connects to your PC via USB 2.0 Type A connection and has almost ten feet of cord. The cans themselves weigh in at almost a pound (.92 to be exact) so they are a bit on the beefy side. 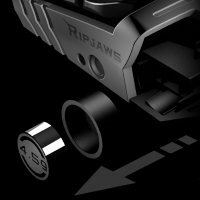 To bring you true 7.1 surround sound, the RIPJAWS SR910 has 10 total dedicated neodymium audio drivers powering each distinctive audio channel. 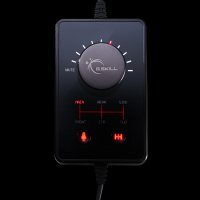 Integrated microphone mute and independent channel volume control gives you instant and accurate control over each audio channel with ease. Below are pictures of the retail packaging you will see on store shelves, or when it arrives in your Newegg or Amazon box! We see it is a black/grey theme with traces of red. There are high-level features listed on the front and back of all devices. The mouse was sitting in form fitting plastic with the accessories (interchangeable side grips) flanking the device. Inside the keyboard box is, well, the keyboard of course, but also the case (attaches to the keyboard for convenient storage) for the ‘gaming’ keys (WSAD etc). The headphones are also attached to form fitting red plastic when you open up its box. Outside of the mouse there are no other accessories included with the rest (unless you count the keyboard palm rest). 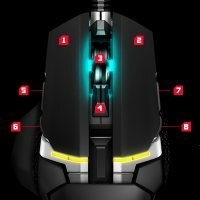 Below are the first shots of the MX780 RGB mouse. I use more of a claw style grip as opposed to palm or fingertip type grips, and it worked well once I had both of the interchangeable side grips attached (by magnets). Otherwise, it is suited more towards the palm grip user as my larger than average hands would touch the mousepad without them. We can see the mouse is split down the middle with a fairly large gap between the main buttons for the webwheel. The webwheel has a geared feel to it which is nice when scanning down webpages or in gaming when switching weapons, making it easier to count when you have several options, so I like that addition. The RGB areas are around the tips of your fingers flanking both sides of the webwheel. The webwheel area itself, under your palm, and the palm rest can all be completely customized with the included software. 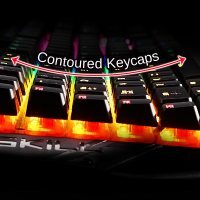 You can also program each key and even a macro for certain buttons so there is a fair amount of freedom when using the MX 780 RGB and its included software. Flipping the mouse over exposes its PTFE glide pads which were silky smooth on the mousepad I used. 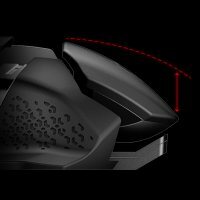 You also see the hole for the Avago laser that G.Skill chose to use on this device. The next shot shows the side of the mouse with the side grips removed exposing the attach point (magnet) and the weights. The mouse weighs in at 111g out of the box which is fairly light. With the included weights, you can balance the mouse to how you like it and that weight can end up at 120G (2 4.5g weights). The last two screenshots show the basic ‘red’ RGB setup and then with the lights dimmed on my mousepad. Next up, the KM780 RGB keyboard. G.Skill kindly sent us the version which uses the Cherry MX Brown RGB keys. The brown keys, as a lot may already know, are tactile in that they have that feedback when you are actuating/pressing the keys as well as a noticeable ‘bump’ which is further feedback the key was actually depressed. The brown switches are a good balance between gaming and typing for most users. First impressions of the keyboard, I have to admit I liked it. 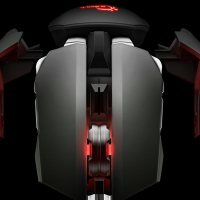 This coming from a (former) Logitech G510 user. I like how that metal dowel frames the keyboard. Other useful features include holders for the wires, a pass through for the USB and audio/mic jacks. The KM780 is, to me, pretty heavy so it feels sturdy compared against a non mechanical keyboard (my G510) anyway. There are macro keys on the left and memory keys on the top left along with the windows lock key (a cool feature for gamers! ), brightness control, and a timer key. On the top right of the board there are media buttons for stop/play/pause, etc, as well as a volume control knob with an LED display that shows its current level. It also comes with a set of extra keys for the gamer. These red keys are angled slightly on one side, depending on the key, and have notches/ribs on the face to set them apart from the other keys. In a strict typing situation these were a bit annoying out of the gate, but after a short time, I barely noticed they were there unless I was gaming and focused on them. To that end, G.Skill includes a handy tool to remove the keys as well as a case to store the extra keys that can mount to that same dowel. The Cherry MX brown keys are said to strike a solid balance between gaming and typing duties, and in the end, I have to agree. The spacing felt quite a bit different compared the G510, and the throws/actuation distance took a bit of getting used to, but I am back on track with typing efficiently after a short period of time to get acclimated. 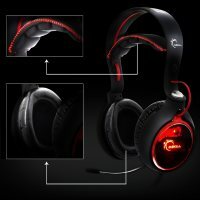 Last but not least in this power trio of gaming peripherals from G.Skill is the SR910 Real 7.1 gaming headset. Overall, I do like the appearance of this set of headphones. The black soft band going over the head with a plastic frame around it, help hold them to your head. Now, I have a small head and the SR910’s are not light coming in at 420g (600g with cord and audio adjustment device). The band and ear cups do a great job at masking the weight, however after long sessions I could really notice it sitting up there. If you look at the backside of the ear cups where the drivers are, you can see through the red LED lit plastic to find five neodymium speakers (two 30mm drivers for front and rear, a 27mm driver for center, 23mm for the side, and a 40mm driver for the subwoofer). It is great to have the drivers for true surround as opposed to software driven as it can give you a better soundstage. Be sure to download the latest drivers from their website as there was audible improvement from the original release drivers. Overall the sound quality was ‘OK’. The biggest problem for me, I found that no matter what I listened to (music from rap to classic rock, Battlefield 4 and Dirt: Rally, and finally a movie), the bass was lacking, particularly on the deep bass. It felt like they just ran out of steam compared to my much cheaper set with a single, larger, driver. This tends to be the case with a lot of multi-driver headphones though so I should have expected it really. A few EQ adjustments and it got better, but it was still pretty light on the low end. The highs sounded good, but wasn’t quite as sharp as I would have expected out of a multi-driver setup either. 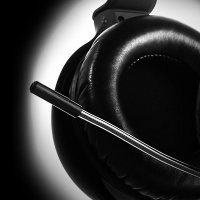 For the cost, which are approaching high-end headphones mind you at $139.99, there are better units out there sound quality wise. The certainly do not sound bad, but the lack of bass, for my personal listening tastes, was really missing. The microphone performance was one of the bright spots here. I logged into Teamspeak and without even saying anything to my peers that were in there, they had asked if I bought a new microphone as I sounded a heck of a lot better. When pushed to have them explain why, they said my voice sounded a lot more clear, if a bit ‘tinny’. But overall they said I sounded much clearer than through my old headset/microphone. The other issue, and this may be system specific, is that occasionally, something on my PC would ‘switch modes’ and cause horrible echoing surround effects. I needed to unplug the USB and plug it back into the PC in order for it to ‘reset’. Again, not sure what caused that, but it didn’t happen with my other cans. I would wager a bet that says its something I am missing. Below we see the included software for each of the components for their customizations. The applications for all of these worked flawlessly. Setting things up was a breeze for each peripheral though getting some of the pre-programmed schemes active on the keyboard took me a minute to figure out…this is more likely a PEBKAC issue though that a software fault as I don’t typically use such customization software. The audio software also worked well in setting up the device to my liking as best I can. About the only complaint with the software was that each device has a separate piece of software to go with it. If you end up going with all G.Skill components, you still have to install all three pieces of software. I wish at least the keyboard and mouse used the same software. 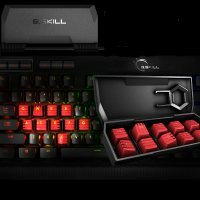 G.Skill has made quite a splash in the market of gaming peripherals with the release of these three products, the KM780 RGB, SR910, and MX780 (Keyboard/Headphones/Mouse respectively). There is very little to complain about regarding the mouse. It felt good in my hand (claw grip with large hands), tracked well on my surface/mouse pad, and had plenty of customization options as far as macros and button assignment with its included software as well as the four area LEDs you can control too. Pricing comes in at $79.99 MSRP, but is being sold at $59.99 on newegg.com. They KM780 RGB keyboard was pretty solid for me as well. It took time to get used to the Cherry MX brown mechanical keys and the slightly different spacing compared to my current keyboard, but after a couple of weeks, it’s like I never switched. Just be sure to get the right Cherry MX key for your needs. Here again there are TONS of customization options from macro keys to individually assigning LED colors it can all be done via the included software. 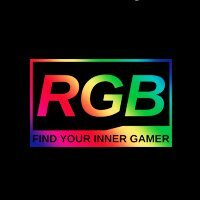 The pricing on the KM780 RGB comes in at $159.99 at newegg.com. Last, the SR910 cans. These I had high hopes for, but in the end was let down by the overall sound quality, specifically, the lack of bass in these multi-drive headphones was really a lot to overcome. That said, I do like my bass heavy so this may not be as big an issue for some users. I compensated by adjusting the sub level up to 3/4 on the dial and boosted the 20-30Hz range in the equalizer a couple of db. They were better than my other 1/8″ Turtle Beach ones from a few years ago and they sure better be at $139.99 MSRP. While this is about right for a true-surround setup, with a single driver your bass needs are likely better taken care of. These can be found on newegg.com for $139.99. 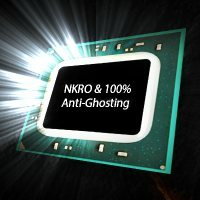 There is little to complain about here with GSkill’s entries. They got most things right bringing these devices to the market, but it is a crowded market segment with a lot of stiff competition. If you are looking for a set of true surround cans, a solid mechanical keyboard with brilliant programmable LEDs, and a gaming mouse with more of the same, these items should be on your short list.